Just a small note here on AA. LiteDOS 2.0 is ready for usage / testing. Mayor parts have been rewritten. Mostly to speed up DUP and to increase compatibility. The only thing you need to format/init/update disks or partitions is the LiteINIT.XEX file. Completely rewritten the build-in DUP, bypassing CIO, resulting in higher IO-speeds. 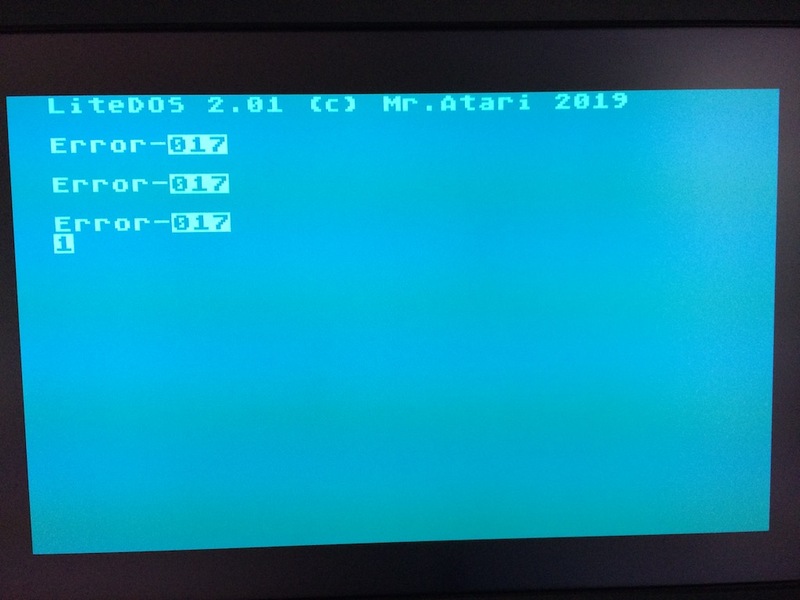 Completely rewritten the DIR output format to "Atari standards". Removed the limitation of cassette usage.
! 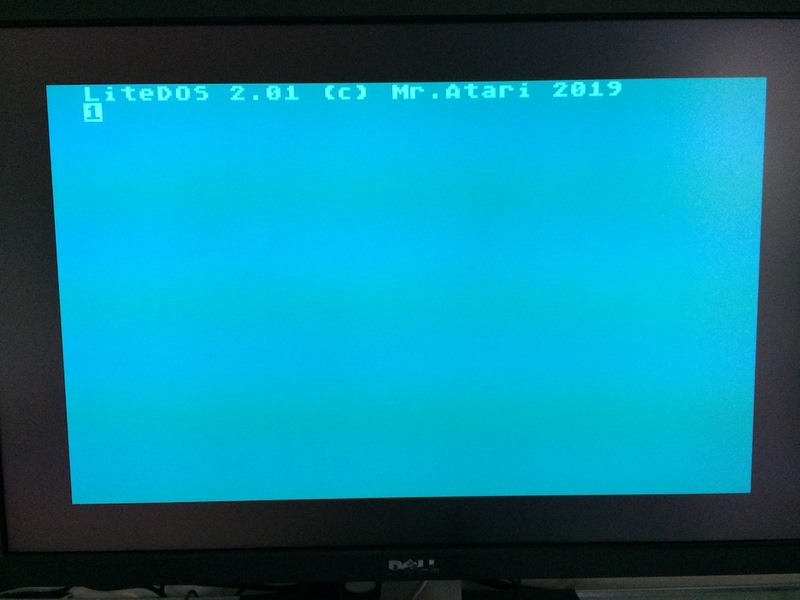 Turbo-BASIC and it tools now work ! Great DOS which I intend to use for my future disk projects. Fantastic work! Many thanks for your work and for sharing. Groeten en gejuich! Is there any chance of an SDFS version of this? Perhaps already existing BW-DOS - Its MEMLO is $1EE4. That is not bad for something that support file system as complex as SpartaDOS. I guess it wouldn't be enough. Did you download 2.01 ? If you did, tell me when you are running / emulating, so I can investigate. I have 5 bytes to spare at the moment, so no room to implement extra complicated things. Booting is only 15 sectors, so yeah, that is fast. Edited by mr-atari, Fri Feb 1, 2019 2:13 AM. why is it faster booting on 800? Yes, it is 2.01. If i boot with OPTION pressed i get the title screen, with the reversed 1. See pic. No cursor, just '1'. If you press enter, you get an error. I've pressed enter 3 times. Then, if you press 'D' you don't get the listing of disk1 as the documentation suggests, just the free sectors. Same for D1 and D1*.*. No content, just the nr of free sectors. If you press D2*. * you DO get the contents of disk2, but... it gets garbled and shows rubbish at the end. If i boot with BASIC, i get the litedos 2.01 title screen and the READY prompt. Enter DOS, and exactly the same effect as above from there. Machine is a baremetal 64K 600XL. Edited by jowi, Fri Feb 1, 2019 8:07 AM. but what disk drive are you using? I'm using AspeQt /w SIO2USB. Tried the same using Altirra, exactly the same effect. Edited by jowi, Fri Feb 1, 2019 8:54 AM. That is ok. It is the prompt saying to you that it is using drive #1. Ok, you did not type any commands, so it replied with error. Ok, because there are no files on that disk. So, you don't see anything, only the free sectors. This is because your disk in D2 is not a LiteDOS disk, so it reads the files but show to you no free sectors and the hearts. Yo can't write to that disk, but you can read files from it. To copy a file from D2 to D1, just after typing "D2" move the cursor over the file (for example, over "TEST1 SRC" and write over the blanks "C1", so it will read "C1TEST1 SRC 001" and press ENTER. Now, if you go to a blank line and type "D1" you will see your file. Ok, i understand. I find the reverse 1 as prompt confusing, also the fact an enter throws an error is counter-intuitive. An actual bad command should throw an error, not an empty return. I understand litedos could read dos 2.0/2.5 floppies? So i don't understand the display of hearts etc? Gives the impression it can't read anything/locks up and just ends in showing garbage. The "one" is to see on what drive you are. typing D, just a helping hand. In the previous versions, you just had a prompt, not knowing what default drive you are on. When you have done D2, it changes to "two". 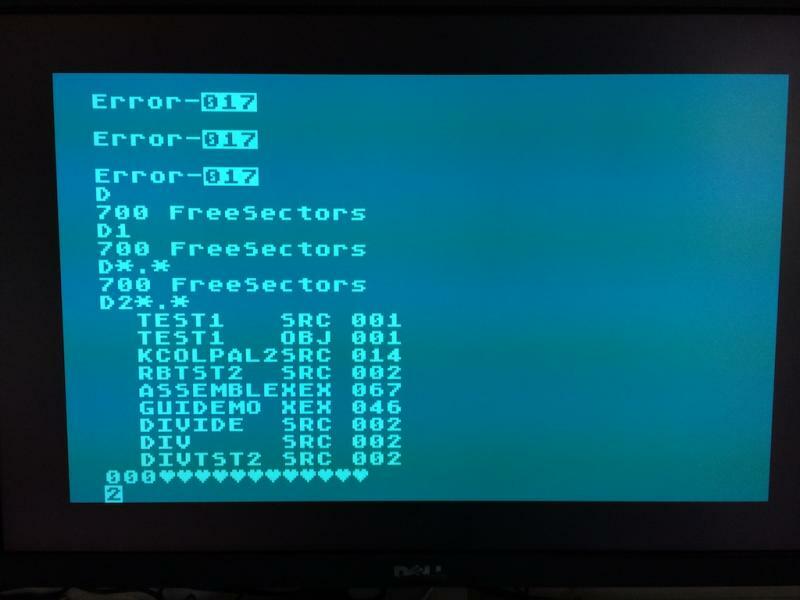 The freesectors message is not on a 2.0/2.5 disk (as it is on LiteDOS, to save RAM), so it sends out zeros/hearts. I have no spare room to change this, so for now it stays this way. Removing <return> as error, I can do. Edited by mr-atari, Sat Feb 2, 2019 1:25 AM. The 400/800 does no device-polling, that saves you an extra 3 seconds. I removed the hearts after the 000, zero file-space. Pressing <return> now does the same as D, sending out DIR to the screen of the default drive. This looks better don't get me wrong, it is your product and i understand space is limited. Are you going to make this fix available to us users. I have checked the website but it still only has the 2.01 ..
Edited by rdea6, Thu Feb 7, 2019 9:15 PM. But I am out of space, so I need to re-think some routines or support. Most likely I have it with me to Maarssen the 16th to show LiteDOS and PLATO on the Atari-Invasion. 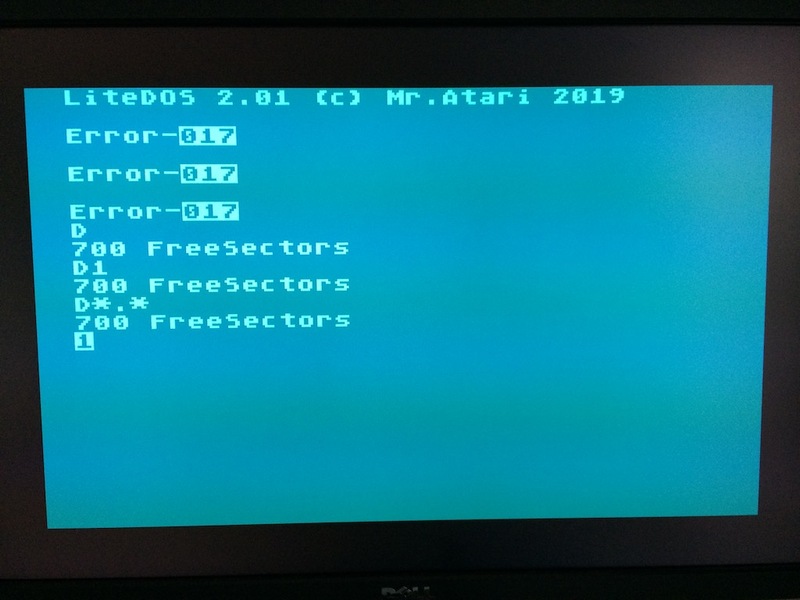 ATARIDOS compatibility on SD,MD,DD diskettes. Copy from/to the same drive, will move (defrag) the file to lower free sectors. Filename now has bit-1, to mark the file as "DOS2"-type. 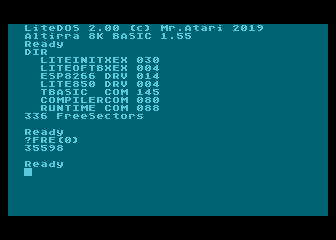 File-ID added on disks with less then 1024 sectors (10bit sector-link), for ATARIDOS compatibility. 8% more file-space on Medium Density disk: 10bit sector-link, LiteDOS is booted from sectors 1024-1037. 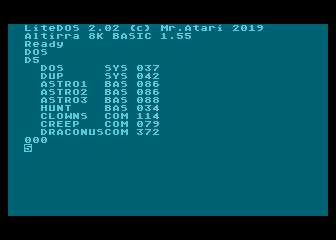 Dos 2/2.5/Clones now can read files from LiteDOS disks or partitions with less the 1024 sectors. MyDOS/clones can read files from larger disks/partitions using bit-2 of the filestatus. I tested SDX 4.48 were I hacked/patched the test for the "Directory Type" accepting the negative values used in LiteDOS. Now I can see the directory and load files. Without this patch/hack, I get "148 Unknown file system"
So, it's up to SDX to support LiteDOS, read_only would be nice. Back to coding, next release hopefully before next weekend. New version 2.02 (18-feb-2019) online. Files are saved conform DOS 2/2.5 and/or MyDOS or clones. Seems to work at my place. SDX 4.49c/hacked to pass negative "Directory Type" as DOS 2.0 style. Removed a bug that was present since day 1, displayed file-size was incorrect when >256. I have that fixed in the next release. Init of DD disks/partitions now create a boot-able system. Turbo-BASIC with 38.5k Free memory included, compiled at $1000. Homepage updated, SIO2WiFi moved to a separate page. I created a MyDos 30960 sector atr and then copy pasted the LITEDOS boot sectors to this Koapics.atr then used and emulator to create folders A to Z and copied D:A>*,2:A>* until I got to Z> then copied over working files for reading the KOALA pictures. The only basic file that will work is KOALITE.BAS all the com files should work okay. This ATR is not the best because the LITEINIT.XEX doesn't like to do MyDos files. Hmm, ok, not a good idea to make a non litedos, litedos this way. Better use liteinit, create a 32k sector disk and use the C copy function to copy files from non litedos to litedos. That way the disk is usable for all. 8% more file-space on Medium Density disk, LiteDOS is booted from sectors 1,1024-1037. Abuse/miss-usage of the update function fixed. RENAME leaves garbage in the directory on the 8th file-name, fixed. <Return> on a occupied line = "load file"
<Return> on a empty line = "dir"
Many routines optimized to squeeze this new code into RAM below $1000.